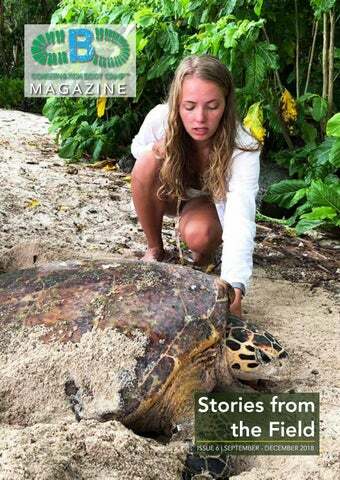 Published by Â© Nature Seychelles June 2018. All rights reserved. No part of this document may be reproduced in any form or by any means without permission in writing from the publisher. 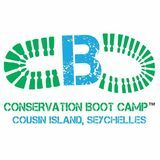 The Conservation Boot Camp takes place the whole year. 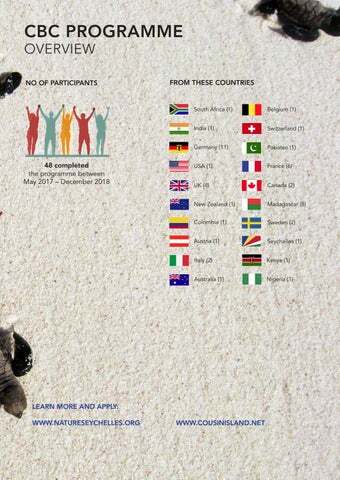 This is a very exclusive program and with a maximum of only 6 to 7 persons per session. Each session lasts for 4 weeks. You will take part in some of the successful long term work here on Cousin Island. 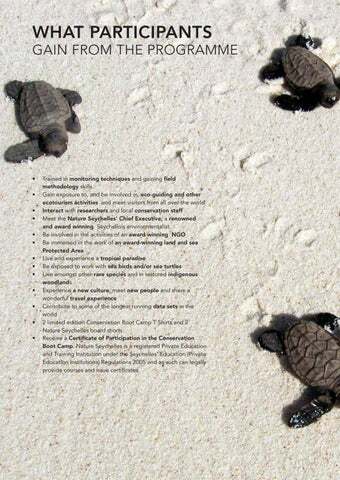 You will pick up a “fistful of skills” which, depending on the time of the year, include monitoring of endemic land birds, sea turtles, seabirds, and vegetation, ecotourism guiding, invasive species control, and island maintenance. The method is Learning-by-Doing. In-field training will be given for sensitive work such as seabird and turtle monitoring. The normal working hours out of turtle season are between 5 – 7 hours, daily on weekdays. During turtle season, we can reach 9 hours of work daily with one day off including weekends. Below is an overview of the conservation work planning. There is no Planet B. But there is Cousin Island Special Reserve. 2018 was an incredible year in terms of bad news on the media. Confusing news, fake news, alternative facts, pseudo-science, and just terrible public portrayal of leaders. But, pull away from the media circus and do a deep dive onto the real world and one can see that 2018 was in fact a year of hope. There were conservation successes, huge wins for global health, more peace and tolerance, less war and violence, rising living standards, some big clean energy milestones, and a turning of the tide in the fight against plastic. Then of course there is the amazing Cousin Island Special Reserve and the remarkable conservation and education work of Nature Seychelles there. mesmerizing and when you stumble upon wildlife in every corner, this is only magnified. My second day on Cousin was overwhelming beyond words. We spent the day time exploring the islandâ&#x20AC;&#x2122;s forest, numerous beaches, and the ocean, whilst at night we were literally star struck by the night sky; more stars were packed into your sight than you could even begin to imagine. The very same day, I immersed myself into turtle patrols. The Conservation Boot Campers were introduced to our first turtle on one of the more popular nesting beaches. We watched with bated breath as, with nothing but determination behind her, she dug a total of six egg chambers before finally (exhausted, no doubt!) she laid her eggs. It took her approximately three hours from start to finish. Each moment was unique and impactful. These ocean dwelling reptiles are accustomed to being weightless, but with sheer grit and drive, she struggled with her weight up a shelly beach (like hundreds of others have before her and will in the future) and did not stop digging until she was absolutely ready to part with her offspring. If this trip has taught me anything above all else (and I have learned ALOT!) it is that no matter how difficult the task ahead may seem, you must keep on going until you succeed. I would like to say a huge thank you to Yan, the other CBC team members, Kara, Charlotte, Nola, Dailus and all of the Wardens on Cousin for making my experience here so simply and truly, magical. But at the same time, you only want to look out for the numerous birds that provide an impressive background noise. The ground-breeding Whitetailed tropicbirds sit behind every second tree trunk, while the White tern simply lays its eggs on a branch without a nest. You can also discover the Seychelles magpie robin, shimmering blue in the sunlight, from which each of the approximately 50 individuals on Cousin can be identified by coloured rings. And the flora with the mangroves, huge Casuarina trees and the brittle Pisonia trees is amazing too. After the first week of presentations, our first turtle patrols, an introduction to bird monitoring and the nest box check, all of us had checked into the CBC everyday life - and it was never boring! One of the most exciting moments for me was seeing the first sea turtle in my life! And every other Hawksbill turtle I saw while laying their eggs was just as fascinating! Time just flew by... and at the end of the month I even got over making my first own guided tour with visitors! for the importance of our work on Cousin and its beauty amongst people who didn’t know anything about the island before. My last words will be advice directly for you, dear future-CBC-participants: Despite the numerous tasks and the hard work you will be asked to do, you always have to remind yourself of two things: •	What is the real reason you are take part in the CBC? - Because you love nature and you want to make a difference. •	Look at how beautiful this island is! Not many people are as fortunate as you are, being able to live in paradise for 4 weeks. Remembering these things will help you enjoy your time even more. You will have your very own special highlights. Mine have been definitely these amazing sunsets: Go grab a cold drink, climb some rocks or find yourself a cozy spot on the beach, and just watch. It wasn’t only once that watching a sunset left me speechless and completely lost in my thoughts... man, I miss these days already. Escape to paradise By Eddah Ritah OKOTI I knew I was going to have a lot of fun on the CBC, but to tell the truth, I didnâ&#x20AC;&#x2122;t expect all the fun I had as a participant. I spent the entire two weeks with the program Coordinator (Yan Coquet) and Conservation Manager (Kara Beggs), listening to them, working with them and learning from them. It was a unique lifestyle and adventure, everything was so different from my normal routine. Starting with the cool ocean breeze, the friendly giant Aldabra tortoises all the way to the ever green forest, which is a habitat for the most interesting small animals and birds you will ever see. I arrived on Cousin Island on Monday 15th Oct. I have always been encouraged to push past my limits. city was nothing less than liberating. The day was cloudy and the sea was rough on December 3rd when I got picked up by the Nature Seychelles team at the Jetty in Grand Anse. They had warned me that we’re going to get soaked, little did I know that ‘soaked’ was just a really nice way to put what happened next. Luckily I don’t get sea-sick. The little boat crushed through the waves and it felt like we’ve been put straight into the spinning cycle of a washing machine. We arrived at Cousin Island with all our stuff and ourselves dripping with water, but with smiling faces and happy that we’ve finally made it to this magical place. The first two weeks of turtle patrols, Seychelles magpie robin monitoring and various chores as well as hill climbing and the constant fight against vicious mosquitoes has taken me out of my comfort zone more than anything before. And I have enjoyed every minute of it. Being able to witness the first Hawksbill turtle go through what looks like an utterly exhausting act of nesting at the beach was the closest I have ever felt to nature. always been encouraged to push past my limits. Being a passionate environmentalist myself, I couldnâ&#x20AC;&#x2122;t have picked a better place to learn about wildlife conservation. And for Cousin Island Special Reserve being carbon neutral just makes my eco-nerdy heart sing. I am thankful for the rare opportunity of being a part of this special program and the people who have made my time here worthwhile. lifted about 10 cm from the sand. At first I thought it was cute, which it was, but then I wondered if this was normal for Hawksbills. I now know that it's not - she must have been special. That same turtle came back two weeks later, and as soon as the contractions started, I knew it was her! for them, but also the amount of effort they put in every nest. From emerging up the beach, digging the egg chamber, laying between 60-250 eggs and then covering the nest, these mothers are some of the toughest in the ocean. For anyone who is thinking about working with sea turtles, do it, because I think that it takes close encounters with these creatures to realise how special they are. Come to Cousin, be with turtle, fall in love with turtle, and let that influence the way you live your life. Be considerate, don't litter, don't exploit, and don't be invasive of these creatures - let's appreciate what wildlife we have left, but make efforts to conserve it along the way. Conservation Boot Camp participants pick up handful of skills that include field techniques, character building and social skills that will help them in their future conservation careers.